The former secretary of defense presided over the deaths of millions--and was one of the only officials to publicly express regret. Secretary of Defense Robert McNamara is shown at June 29, 1966 Pentagon news conference in Washington. Wiesner, a friend of McNamara’s, thought he should know what I had seen, and the purpose of the meeting, which by agreement was to be held confidential, was to tell him. I didn’t know it, but his loss of faith in the war was already well underway, and that November, he would leave office to take up the presidency of the World Bank. The familiar figure with the glinting, rimless glasses and the rigid hair forced back, as if it were spun glass, greeted me at the door of his seemingly tennis-court-size office overlooking the River Entrance of the Pentagon and, in the distance, the Washington monument. In the man I met, I felt a prodigious, ceaseless, restless energy that I suspected he could not turn off if he wanted to. Doing one thing, he seemed already to be thinking about the next, or the thing after that. At rest, he seemed to be moving more quickly than most people when running. As I began to recount my observations, he pinned me with a stare. My feeling was that he was not precisely a good listener but might, in his self-directed way, be a good absorber of information. He took me to a map of Vietnam on an easel at the back of his office, and asked me to locate the areas of destruction. I felt that the request was a test–one I happened to be excellently prepared to take, as I had carried maps with me in the forward air control planes, and measured levels of destruction in the entire province of Quang Ngai. He seemed deeply engaged, but made no comment, asking me only if I had anything in writing. I said I did, but that it was in longhand. He suggested that I produce a typed copy, and provided me with the office just down the hall of a general who was away, if memory serves, in Africa. What he did not know was that the article was book-length. It turned out to take three days to dictate the piece into the general’s Dictaphone, with chapter after chapter emerging perfectly typed from the bowels of the Pentagon. I handed the finished project to McNamara, who thanked me, but said nothing further about the matter, either then or at any time thereafter. Yet there was a sequel. Fifteen years later, in 1982, when Neil Sheehan was researching his classic book about the war, A Bright Shining Lie, he came across several documents concerning my Pentagon-assisted manuscript, and brought me copies. It appears from the documents that McNamara had promptly sent the manuscript to the American ambassador in South Vietnam, Ellsworth Bunker, who in turn ordered a certain Hataway to retrace my steps in Quang Ngai and Quang Tinh, and also requested a Bob Kelly to write an overall report, with a view to discrediting my reporting, and arranging to get The Atlantic magazine (where Bunker mistakenly thought it was scheduled to appear) to “withhold publication.” A memo recommending these things was circulated to McNamara, Under Secretary of State Nicholas Katzenbach and Assistant Secretary of State William Bundy. The “action” officer was Secretary of State Dean Rusk. Those I had interviewed, including the forward air control pilots, were re-interviewed, and affidavits were taken from them. Two civilian pilots were dispatched to over fly the province and check my calculations of the damage. Plans were considered to publicly rebut my findings. However, the resulting report inconveniently found that that “Mr. Schell’s estimates are substantially correct,” and it appears that no further action was taken. 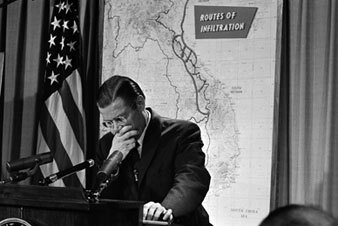 In any case, Robert McNamara, disillusioned with the war, announced his resignation as Secretary of Defense around this time. Perhaps frustrated by his failure to find factual errors in my reporting, the author of the report offered some editorial comments that inadvertently epitomized the flawed thinking on which the entire war rested. I had been unaware, he thought, of some extenuating factors for the destruction I had witnessed. I had not known, he thought, that “the population, is totally hostile…” Indeed, in the eyes of the Vietcong, “the Vietcong are the people.” Thus did the main reason for not fighting the war in the first place, namely the perfectly obvious hatred of the majority of the population for the American invasion and occupation become, in this calculation, a justification for continuing the war. When I next spoke at length with McNamara, in 1998, it was not about Vietnam but about nuclear arms, on which we were agreed as much as we had disagreed about Vietnam: we both believed that the only decent and sensible thing to do with the bomb was to get rid of it. McNamara’s turnabout in the nuclear matter was dramatic. More than any other government official, he had been responsible for institutionalizing the prime strategic doctrine of the nuclear age, deterrence, otherwise known as mutual assured destruction. Now he wanted to dispense with it. But in fact, by then we were closer on Vietnam as well, for he had, after two decades of silence regarding the war, published his book In Retrospect, in which he repudiated his former justifications for the war, famously writing of the Kennedy and Johnson administrations, “We were wrong, terribly wrong.” He had also revealed an emotional side under the platinum exterior. We know now that at a meeting within the government to say farewell to him as Secretary of Defense, he wept as he acknowledged the uselessness of the bombing of Vietnam. Was he thinking of the devastated villages of Quang Ngai? I don’t know. On many occasions when confessing his errors regarding Vietnam, his voice shook or cracked and tears came to his eyes. Like a certain kind of man of his generation, he was emotional without being introspective. The book was “retrospective,” not introspective–it was public reflection on a public matter, and contained almost nothing in the way of soul-searching. In its tone and style the book, though it had to be written out of a profound reservoir of feeling, reached for the stable- ground objective analysis. Many critics have asserted, rightly, I think, that he stopped short of full understanding, that he sought to hold fast to claims of noble intentions that the record cannot sustain. The issue is how noble intentions really are when the facts that show their results turning to horror are readily at hand yet overlooked. Should McNamara have been more forthcoming in his regrets? He should. Should he have expressed them earlier? Certainly. Should he have resigned in protest once he understood that the war was futile and wrong? Yes. Should he never have recommended the war or presided over it in the first place, and should there never been an American war in Vietnam? Oh, Lord, yes! Recent American history with Vietnam subtracted? What a vision of a better country that was attainable but lost. Certainly, if one puts McNamara’s tears in one pan of a scales and the deaths of 3 million Vietnamese and almost 60,000 Americans in the other, there is no doubt which way the scales would tip. On the other hand, how many public figures of his importance have ever expressed any regret at all for their mistakes and follies and crimes? As the decades of the twentieth century rolled by, the heaps of corpses towered, ever higher, up to the skies, and now they pile up again in the new century, but how many of those in high office who have made these things happen have ever said, “I made a mistake,” or “I was terribly wrong,” or shed a tear over their actions? I come up with: one, Robert McNamara. I deduce that such acts of repentance are very hard to perform. If a statue is ever made to him, as probably there will not be, let it show him weeping. It was the best of him.